Members of AFP Manitoba have access to our Mentorship Program for free! Not a member yet? Click here to find out how you can join. 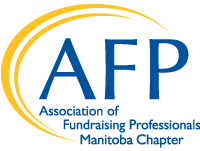 All members of AFP Manitoba can participate in the program, whose goal is to create partnerships that enhance and support our commitment to best practices and ethical standards in fundraising, as well as diversity and inclusion. Each year, we pair mentors and mentees together to create mutually beneficial learning opportunities. Partners often have a shared interest in specific areas of fundraising such as annual giving, major giving, board governance, special events, campaign planning, etc. The program also pairs novice/new fundraisers with seasoned professionals and partners are encouraged to meet at least 4-6 times throughout the year to share knowledge and ideas. Obtaining personal recommendations on educational resources. Download the APPLICATION FORM and send the completed version to KarenF@afpmanitoba.org. Sharing your knowledge and resources to benefit fundraisers throughout Manitoba. Did you know that, as an AFP member, you may also be eligible for national and international programs that offer Mentorship opportunities? The 2019 Mentorship program is already underway, but if you’d still like to participate or are interested in learning more, please email Karen Fowler at KarenF@afpmanitoba.org.